Evapotranspiration is abbreviated ET and is often called crop water use. The term evapotranspiration combines evaporation from soil surfaces with transpiration from plants to describe the total amount of water lost from a crop. Water evaporates from any moist surface into the air as long as the air is not saturated. This process is called evaporation. Evaporation from plants is called transpiration. Plant leaves evaporate water through tiny adjustable openings called stomates that are scattered across leaf surfaces. Water moves from the soil into plant roots, through the plant, and finally out through leaf stomates. There would be more evapotranspiration occurring on a hot, sunny, windy day then on a cool, cloudy, calm day. Early in the season, when plants are small, water loss is primarily from soil evaporation. When plants are large, water loss is primarily from plant transpiration. Smart irrigation management begins with knowing crop water use. The goal is to give the plants exactly what they need when they need it. If a crop does not get enough water to meet its maximum demand, yield will decline. 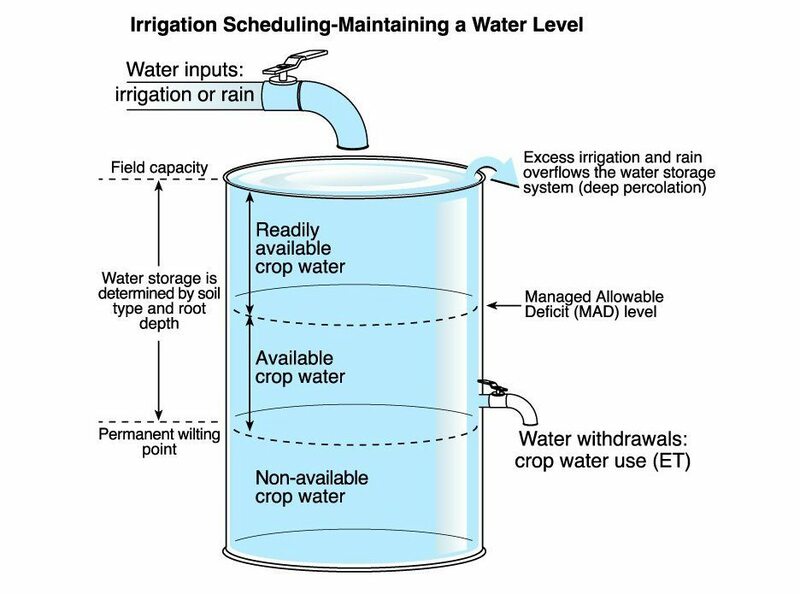 In fact, crop yield increases as water availability increases to the level of peak crop water use. Irrigating beyond this level does not benefit the crop and may actually cause harm. Increased pumping and water costs erode profits. Excess irrigation water may run off or percolate below the root zone, removing nutrients and chemicals from where they are needed. To attain the highest profits for most crop and situations, irrigation must be managed to prevent both crop water stress and excess irrigation. How Do Plants Utilize Water? Crops use water for several purposes. During hot periods, the most important use is to cool the plant. Water that evaporates from your skin cools your body. In the same way, water that evaporates from a plant cools the plant. Without evaporative cooling, the sun's energy would quickly overheat plant leaves. Cooling is such an important function that plants transpire more than 99% of the water they absorb during their lifetime. A second function of water is to transport nutrients throughout the plant. As water moves from the soil through the roots and to the leaves, nutrients are carried along as well. Though nutrients are very important for crop growth, nutrient transport is considered a secondary function of water movement since much more water is needed to meet the cooling needs of a plant. Finally, a very small portion of water, less than 1% for most crops, remains in the plant tissue. This may be surprising since water makes up more than 90% of the weight of most crops. This shows how much water plants use for other purposes. How Does Weather Affect Evapotranspiration? Many formulas have been developed to calculate evapotranspiration. In Kansas, the formulas used to estimate evapotranspiration are called combination equations. This is because the energy available to drive the evapotranspiration process needs to account for all energy sources the plant is exposed to; including energy from advective energy. Advective energy is heat energy transported to a crop by wind. Since Kansas climatic conditions are very advective, evapotranspiration methods must account for this. The amount of energy available to drive the evapotranspiration process is routinely measured at a number of weather stations across the state. These factors are temperature, relative humidity, solar radiation, and wind. Reference evapotranspiration values that are available today were developed by researchers who carefully measured weather conditions, while at the same time observed and measured the water use of a reference crop. Two commonly used reference crops are grass and alfalfa. These crops were used as references since they can be maintained at a certain height and stage of growth for long periods of time during a growing season. A common method for developing reference evapotranspiration formulas involved the use of weighing lysimeters. Weighing lysimeters are essentially containers of soil that are mounted on a very accurate scale system. Whenever the reference crop being grown in the container was at the reference growth stages weather observations and water usage data was collected. 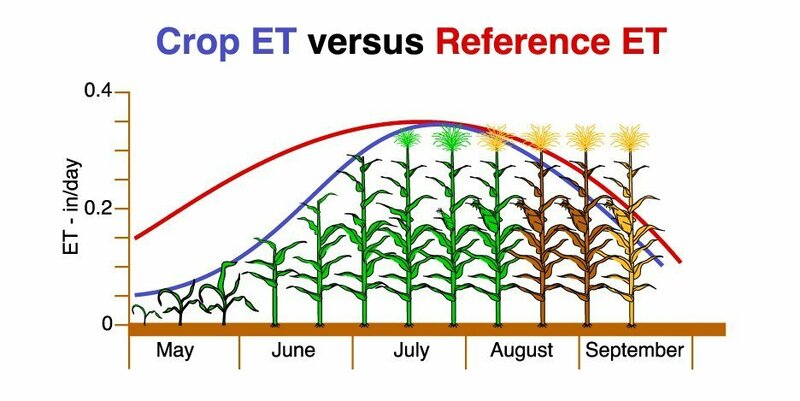 Does Evapotranspiration Change As The Crop Grows? The crop coefficient reflects these differences and is used to estimate evapotranspiration by comparison with evapotranspiration from a specific reference crop. Different types and varieties of plants are capable of moving water at different rates. They also have different maximum rates of evapotranspiration demand. The same crop may have very different water usage rates depending on the stage of growth or the relative amount of canopy cover. Many of these differences are included in a term called the crop coefficient. The crop coefficient reflects how the evapotranspiration of one crop compares with the evapotranspiration of a reference crop. For example, alfalfa is often used as a reference crop. Compared to the reference crop under a specific set of conditions corn typically evaporates less water. The difference between various crops and canopy characteristics will vary. Thus, if reference evapotranspiration is known, crop coefficients for corn or other crops can be used to quickly estimate evapotranspiration values. Is Soil Moisture And Evapotranspiration Related? If water is not available in the root zone evapotranspiration cannot occur. Soil, water, and plant relations are very important to crop evapotranspiration and they are critical to effective irrigation management. Soil characteristics determine how much and how tightly water can be held in the soil and how quickly water can move to plant roots to replace absorbed water. Rooting depth determines the volume of water the plant can access from the soil. Together, these factors control the amount of water available to the crop for evapotranspiration. These relationships provide the basis for developing a crop water budget or an irrigation schedule.